Before finding out how to get 500 clan members for Vampire Wars, the gamer might wonder why bother with this much social networking in the first place. The answer is simple: when entering combat, the player chooses to go up against weaker vamps with less clan, a lower skill ranking and a lower level of play. If the gamer fails to grow her clan, she may still increase in level – this is easily accomplished by doing missions alone – but the skill ranking steadily decreases when other higher-ranked players attack. As a result, the game soon loses its luster and the gamer misses out on what promises to be hours of online fun. Avoid boredom by growing the clan and starting to do so early on within the first few levels. Remember that while the actual limit of active game play allows for 500 members per clan, Zynga rotates through the complete number of a player’s clan and chooses at random those that support the player. Having more clan than required allows the player to make up for inactive or low-level players by also including a good number of daily players and higher-level vamps. 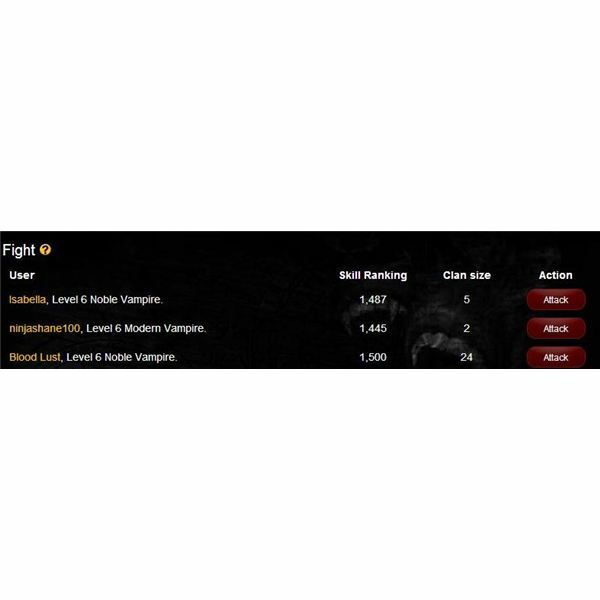 Recent changes within the game also let Vampire Wars players “share” mission items (consumables) — such as they would be used for adept missions — and free health, experience and rage boosts. Posted on the players’ Facebook walls, they are fair game to other online players on a first-come-first-served basis. This has given way to what some criticize as a legal Vampire Wars cheat: the adding of low-level players by those far advanced within the game. Although rarely discussed, some higher-level players find that friending and adding lower-level players to their vampire clans heightens the odds of stocking up on mission items. When considering that the competition for consumables posted by a level 10 player is far less than it would be for a level 110 player, it makes sense to actively court these new vamps. Yet how does a player go about finding them? The MMO player may buy three clan members for 20 favor points. Favor points take a while to earn. It is possible to purchase favor points for cash, but this becomes a costly undertaking. Another downside of this kind of clan setup is the lack of active players that send gifts or post mission items to the Facebook wall. On the upside, especially beginning Vampire Wars players benefit from a show of force on the combat roster. Players that routinely beat the gamer are excellent choices for friending on Facebook. Send a friend request and include ‘Vampire Wars’ in the comment field. It lets the other gamer know why a player wants to become Facebook friends. This is a slow process, but it has the advantage of letting the gamer pick and choose which vamps to add to the clan. As a result, she can pick high-level vamps that strengthen the clan early on, when she is the weakest. One good example is the Stone Cold Pimps group on Facebook. Active players post their need for more clan members, and other players simply go down the list and add them. This can be time-consuming, especially if players want to check out these gamers’ Vampire Wars stats before issuing a friend request. Joining a coven – examples include the Legions of Damnation, Hell's Wrath, Bella Morte’s Clan, Asher's Crypt or Southlands Clan – offers the player the opportunity to add a large number of members in a very short period of time and also interact socially. In some cases, this allows for trading and exchanging of abilities without having to ‘pay’ a blood price. Quite possibly the slowest method of growing a strong clan is to invite current and new Facebook friends. While a player’s social friends might join up out of curiosity, they may not develop into dedicated daily gamers, which in turn does not result in a strong clan. 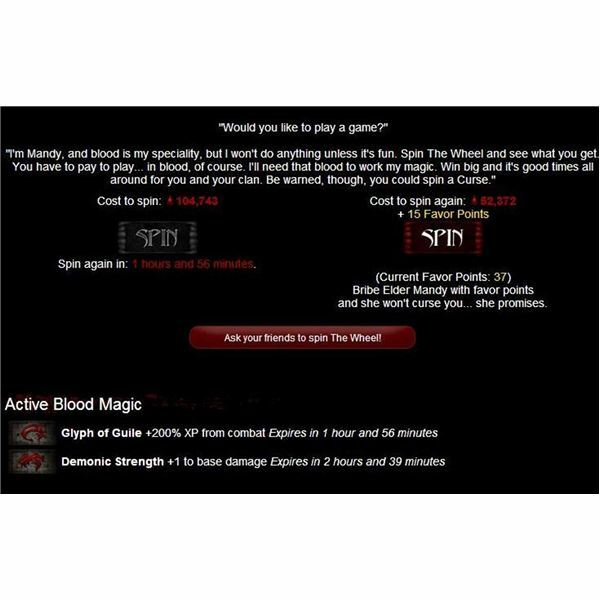 It is tempting to save the tutorial on how to get 500 clan members for Vampire Wars until the gamer reaches an intermediate or even higher level – such as the Savant missions — but this is a mistake. Clan members not only aid in combat, but they also have the ability of sending gifts to the player. These gifts are frequently mission items or special abilities without a blood-unit upkeep attached. A beginning player misses out on these opportunities if she foregoes clan-building early on. Another reason for building a large clan of – preferably – daily players is the benefit from their game-play. 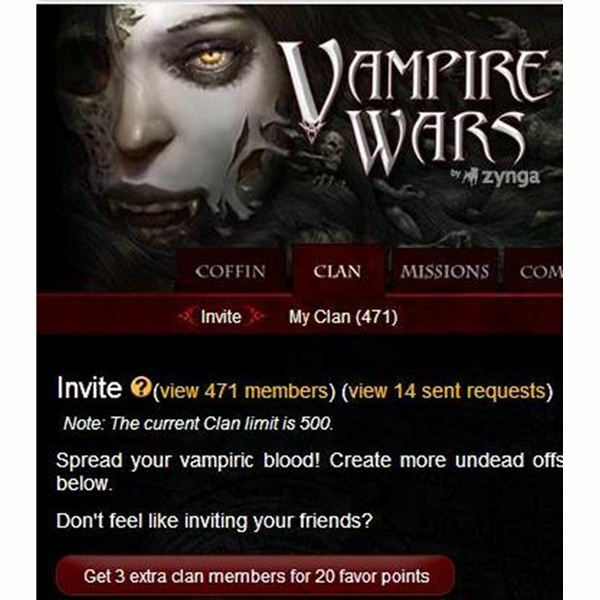 Zynga’s Vampire Wars allows players to swap or loan abilities and share accomplishment points and in-game benefits with fellow-players, which in turn results in experience points, special abilities or special mission consumables.